TOKYO, Japan, December 16, 2011 (ENS) – Prime Minister Yoshihiko Noda of Japan today declared that the damaged reactors at the Fukushima Daiichi nuclear power plant have been brought to a state of cold shutdown, turning a corner in the world’s worst nuclear disaster since Chernobyl. “The nuclear reactors have reached a state of cold shutdown and therefore we can now confirm that we have come to the end of the accident phase of the actual reactors,” Prime Minister Noda told a news conference. 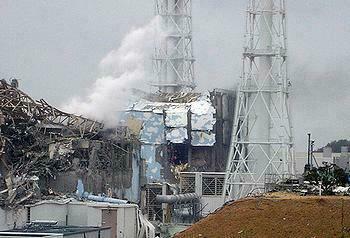 The cold shutdown state – when water used to cool nuclear fuel rods remains below boiling point so the fuel cannot reheat – is a target in the second phase of a timetable established by the government and the plant’s owner-operator Tokyo Electric Power Company to bring the crippled facility under control. On March 11, a magnitude 9.0 earthquake and resulting tsunami knocked out power to the Fukushima Daichi systems used to cool its reactors, triggering a series of explosions, nuclear fuel meltdowns in three of the reactors, and the release of massive amounts of radiation into the environment. TEPCO said today that cold shutdown means the plant is “stabilized in case an accident occurs, we will be able to keep the radiation dose at the site boundary at a sufficiently low level,” not exceeding one milliseivert per year. More than 80,000 people were evacuated after the accident; many are still living in shelters. A 20 kilometer (12 mile) exclusion zone remains in place around the nuclear plant. Many challenges remain, Noda said, including decontamination work in no-entry zones and government-designated evacuation zones around the plant and the return of thousands of evacuees to their homes. The Prime Minister emphasized the need to facilitate disposal of contaminated debris, including the establishment of temporary and permanent storage facilities. It is expected to take decades to deconstruct the damaged power plant and decontaminate the surrounding area. 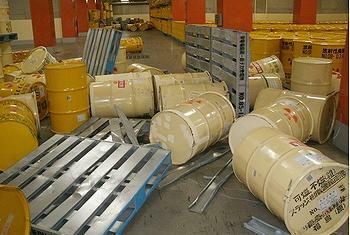 The IAEA defines cold shutdown as being established when three conditions are reached: the reactor pressure vessel’s temperature is less than 100 degrees Celsius, the release of radioactive materials from the primary containment vessel is under control and public radiation exposure by additional release is being significantly held down. The agency is continuing to monitor the status of the plant and the radiological situation in Japan and “continues to stand ready to provide necessary assistance to Japan as requested,” said Amano. Last month, the International Atomic Energy Agency completed its assessment of Japan’s response to nuclear contamination in areas around the Fukushima power plant, highlighting areas of progress and offering advice on issues where the mission felt that current practices could be improved. The mission concluded that “a lot of good work, done at all levels, is ongoing in Japan in the area of environmental remediation,” and that the authorities adopted a very cautious approach in the early phases of the accident. Meanwhile, new problems continue to surface at the damaged power plant. Earlier this month, TEPCO officials said that 45 cubic meters (1,590 cu ft) of radioactive water had leaked into the Pacific Ocean from a crack in the foundation of a water treatment facility. Crews stopped the leak with sandbags. TEPCO said the water contained radioactive cesium at levels “roughly the same as or slightly higher” than the adjacent seawater, and may have contained strontium, a radioactive element which can cause bone cancer.